This week: Inequality as a necessary part of the universe, and, yes, environmentalism (of a sort). 1 FROM what we have said it may be shown what is truly the first cause of the distinction of things. 2 Since every agent intends to induce its likeness into its effect, as far as the effect can admit of it, it does this the more perfectly, according as it is more perfect itself: for it is clear that the hotter a thing is, the hotter it makes a thing, and the better the craftsman, the more perfectly he induces the form of his art into matter. Now God is the most perfect agent. Therefore it belonged to God to induce His likeness into created things most perfectly, as far as is befitting to a created nature. But created things cannot come by a perfect likeness to God, with respect to only one species of the creature: because, since the cause surpasses its effect, that which in the cause is simply and unitedly, is found in the effect to have a composite and multiple nature,–unless the effect reach to the species of the cause, which does not apply to the case in point, since the creature cannot be equal to God. Therefore there was need for multiplicity and variety in things created, in order that we might find in them a perfect likeness to God according to their mode. 3 Moreover. Just as things made of matter are in the passive potentiality of matter, so things made by an agent must be in the active potentiality of the agent. Now the passive potentiality of matter would not be perfectly reduced to act if one only of those things to which matter is in potentiality were reduced to act. Therefore if an agent, whose potentiality embraces several effects, were to make only one of them, its potentiality would not be so perfectly reduced to act as when it makes several. Now by the active potentiality being reduced to act, the effect receives the likeness of the agent. Therefore there would not be a perfect likeness of God in the universe, if all things were of one degree. For this reason therefore is there distinction in created things, in order that they may receive God’s likeness more perfectly by multiplicity than by unity. Notes Some fanciful physical models of the universe (all of material existence, i.e. “matter”) posit it to contain only one substance. A dull place, considering matter can be more than one thing (which is acknowledged even by these models). 4 Further. A thing approaches the more perfectly to God’s likeness, according as it is like Him in more things. Now in God is goodness, and the outpouring of that goodness into other things. Therefore the creature approaches more perfectly to God’s likeness if it is not only good, but can also act for the goodness of other things, than if it were merely good in itself: even as that which both shines and enlightens is more like the sun than that which only shines. Now a creature would be unable to act for the goodness of another creature, unless in creatures there were plurality and inequality: because the agent is distinct from and more noble than the patient. Therefore it was necessary that there be also different species of things, and consequently different degrees in things. Notes Not for the last time Thomas shows inequality is built right into the system. 5 Again. A plurality of goods is better than one finite good, since they contain this and more besides. Now all goodness of the creature is finite, for it fails of God’s infinite goodness. Therefore the universe of creatures, if they are of many degrees, is more perfect than if things were of but one degree. But it becomes the sovereign good to make what is best. Therefore it was becoming that It should make many degrees of creatures. Notes It’s not clear how far this argument can be extended. If two creatures are better than one, and three better than two, at what number of creatures does betterness stop—or does it? If it does not, then where are all the other creatures? God likes men, however, as those not in love with God do not. Be fruitful and multiply. The same critique applies to the next argument. 6 Further. The goodness of the species surpasses the good of the individual, even as the formal exceeds that which is material. Hence multitude of species adds more to the goodness of the universe than multitude of individuals in one species. Therefore it concerns the perfection of the universe, that there be not only many individuals, but that there be also different species of things, and consequently different degrees in things. 7 Again. Whatever acts by intellect, reproduces the species of its intellect in the thing made; for thus an agent by art produces his like. Now God made the creature as an agent by intellect and not by a necessity of His nature, as we proved above. Therefore the species of God’s intellect is reproduced in the creature made by Him. But an intellect that understands many things is not sufficiently reproduced in one only. Since, then, the divine intellect understands many things, as was proved in the First Book, It reproduces itself more perfectly if It produces many creatures of all degrees than if It had produced one only. Notes What that about inequality, and even inequality is intellect, being built right into the system? Has this been sufficiently remarked yet? 8 Moreover. Supreme perfection should not be wanting to a work made by the supremely good workman. Now the good of order among diverse things is better than any one of those things that are ordered taken by itself: for it is formal in respect of each, as the perfection of the whole in respect of the parts. Therefore it was unbecoming that the good of order should be wanting to God’s work. Yet this good could not be if there were no diversity and inequality of creatures. 9 Accordingly, there is diversity and inequality in things created, not by chance, not as a result of a diversity of matter, not on account of certain causes or merits intervening, but from God’s own intention in that He willed to give the creature such perfection as it was possible for it to have. 10 Hence it is said (Gen. i. 31): God saw all the things that He had made, and they were very good, after it had been said of each that they are good. For each one in its nature is good, but all together are very good, on account of the order of the universe, which is the ultimate and noblest perfection in things. Notes God was an environmentalist before there were environmentalists, but as He liked people and modern-day environmentalists do not, there is a difference. 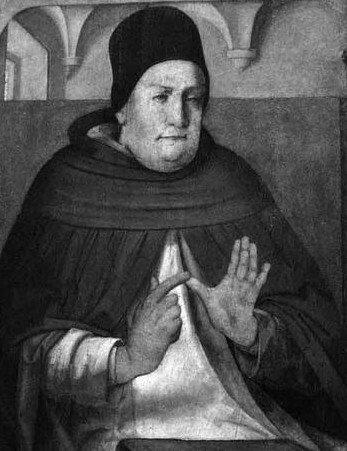 Once upon a time I asked my favorite math teacher where the cause of distinction came from (I was thinking in terms of binary, 1 vs 0) – he sheepishly replied “I’m not that smart!” but darn you Aquinas if you didnt answer my question! Three cheers for the Bellowing of the Ox! I always regarded myself as superior to my bullmastiff although the jury is still out with my cat and I accept my role compared to my wife. It is some comfort to know that the combined worth of our diverse differences is not just good but “very good”. Like I said once before, God-shatter. That’s what we are.